Conclave 2009 kicks off in Grand Fashion! NEW ORLEANS, La. 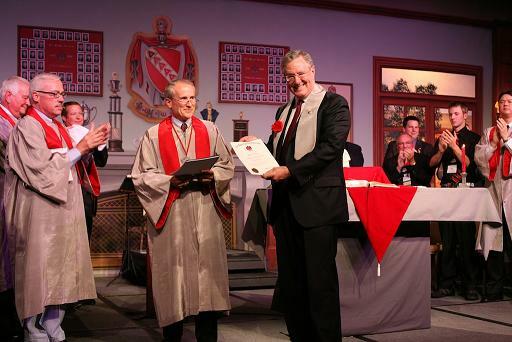 – Tau Kappa Epsilon is proud to announce the 250,000th member has been initiated into the bond. More than 900 Fraters welcomed the newest Frater with a standing ovation and many shook Steve Forbes’ hand as he found his seat for his first official meeting. Many in the crowd were excited for the momentous occasion, but one could feel there was more too it than just that. Frater Steve talked to the attendees for a few minutes about why he decided to become a member and how important it is they take advantage of this time as young collegiates, alumni and volunteers. Forbes gave examples such as looking at sand and how plentiful it is, yet when one man looked at he saw a microchip. In the end, we he created something we now can’t live without. Another example he gave hit a little closer to home – talking about the household commodity of coffee. Frater Howard Schultz (Theta-Iota, Northern Michigan University) saw this as an opportunity to capitalize on creating coffee as an experience instead of simply a drink. In the end he helped create Starbucks and we enjoy this almost everyday and see this brand on almost every street corner or airport. The first session of Conclave concluded late in the evening Thursday, but many Fraters continued the celebration in the hotel and on Bourbon Street. Friday will entail educational sessions, an awards lunch, kickoff ceremony and House of Blues Celebration. Stay tuned for more news updates.